In series of tweets, Marc Lamont Hill says he supports "Palestinian self-determination" but not anti-Semitism or killing of Jews. Marc Lamont Hill, the CNN contributor who was fired by the network after advocating for violence against Israel during a speech at the UN General Assembly, insisted on Thursday that he is not anti-Semitic and said he is against violence. Hill posted a series of tweets in which he sought to clarify his position. “I normally would ignore the current drama, but it’s actually important to me that I’m clear and understood. As a matter of principle,” he wrote. “My reference to ‘river to the sea’ was not a call to destroy anything or anyone. It was a call for justice, both in Israel and in the West Bank/Gaza. The speech very clearly and specifically said those things. No amount of debate will change what I actually said or what I meant,” continued Hill. “This isn’t a case of throwing rocks and hiding hands. I genuinely believe in the arguments and principles that I shared in the speech. I also genuinely want peace, freedom, and security for everyone. These are not competing ideals and values,” he concluded. Hill had addressed the opening meeting of the United Nations commemoration of the International Day of Solidarity with the Palestinian People on Wednesday. During his speech, Hill explicitly endorsed the BDS movement and said that "justice requires" a "Free Palestine from the River to the Sea," a phrase that has long been used to call for the destruction of Israel and its replacement by a Palestinian Arab State. He also appeared to endorse violence against the State of Israel. "Contrary to western mythology, black resistance to American apartheid was not" purely nonviolent, he said. "Tactics otherwise divergent from Dr. King or Gandhi were equally important to preserving safety and attaining freedom. If we are in true solidarity, we must allow them the same range of opportunity and political possibility. We must recognize the right of an occupied people to defend themselves. We must prioritize peace, but we must not romanticize or fetishize it. We must promote non violence at every opportunity, but cannot endorse narrow politics that shames Palestinians for resisting, for refusing to do nothing in ethnic cleansing," Hill said. Hill's comments were condemned by several mainstream Jewish groups in the US. “It is a shame that once again, this annual event at the United Nations does not promote constructive pathways to ‘Palestinian solidarity’ and a future of peace, but instead divisive and destructive action against Israel,” Nazarian added. Cooper added, “By the way Marc, where will you put the nearly 9 million Israeli citizens, nearly 20% of whom are Arabs? Any Palestinian entity we’ve been told will be Judenrein—only place left is… Mediterranean Sea." The National Council of Young Israel (NCYI) called on CNN and Temple University to fire Hill following his highly offensive anti-Semitic remarks. 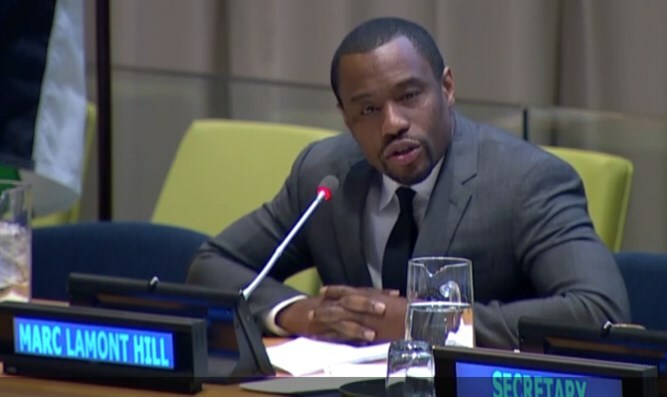 “The virulent anti-Semitism spewed by Marc Lamont Hill is abhorrent, and his senseless promotion of violence against Israel is repugnant,” it said.